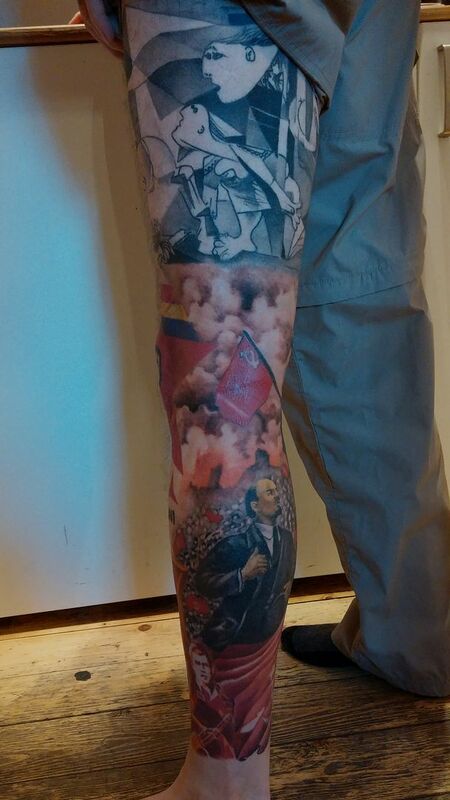 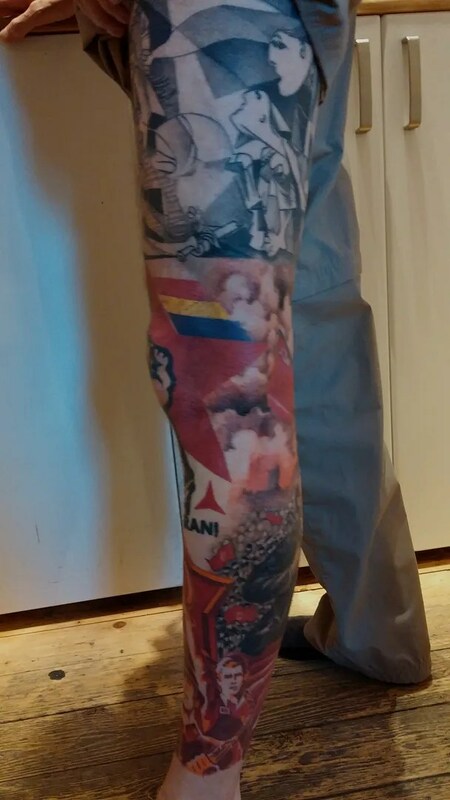 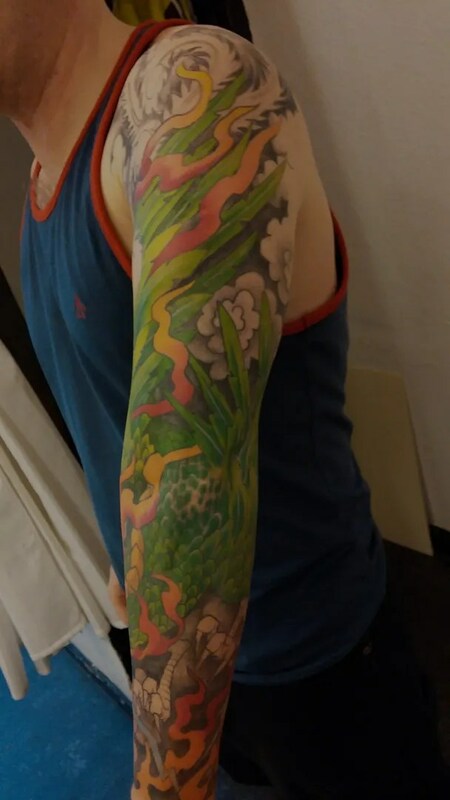 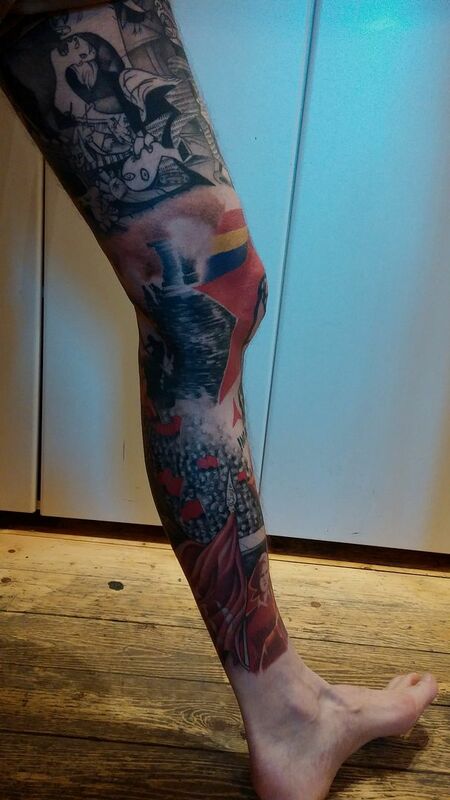 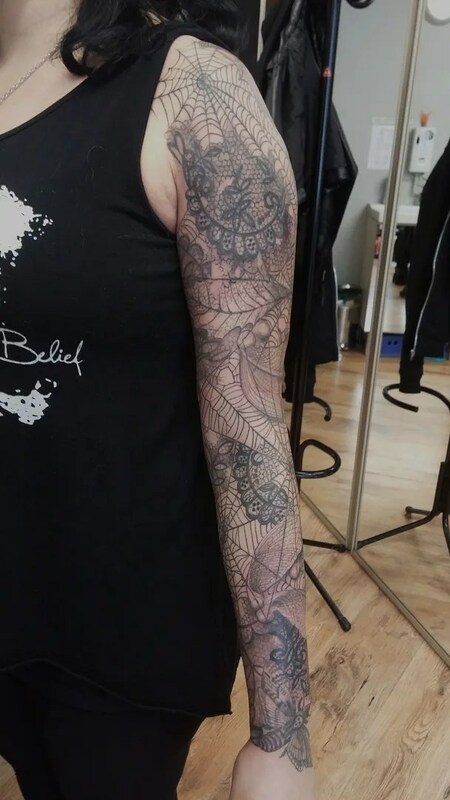 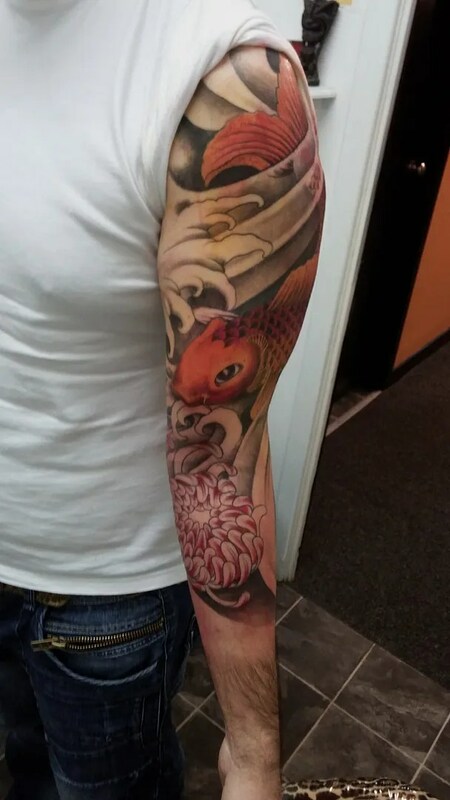 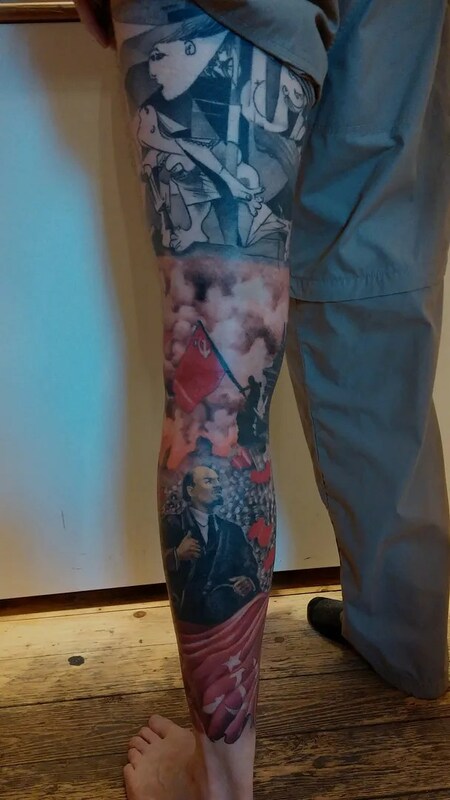 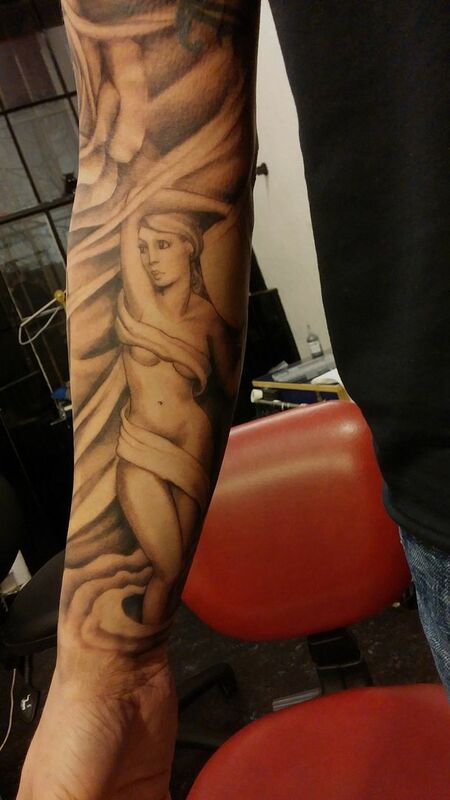 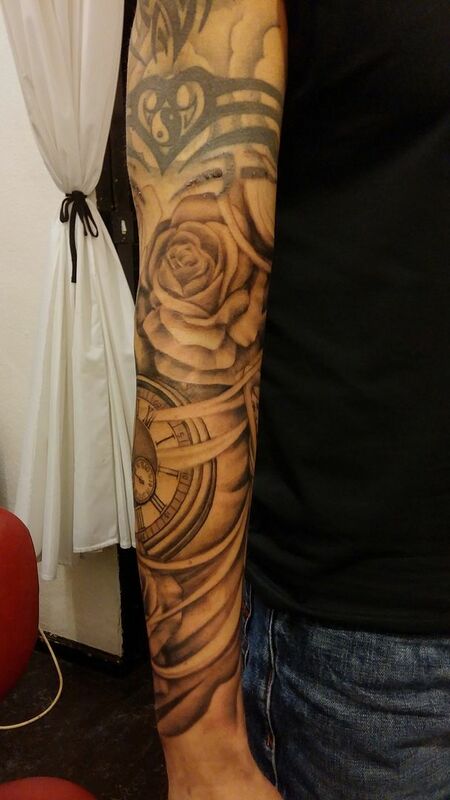 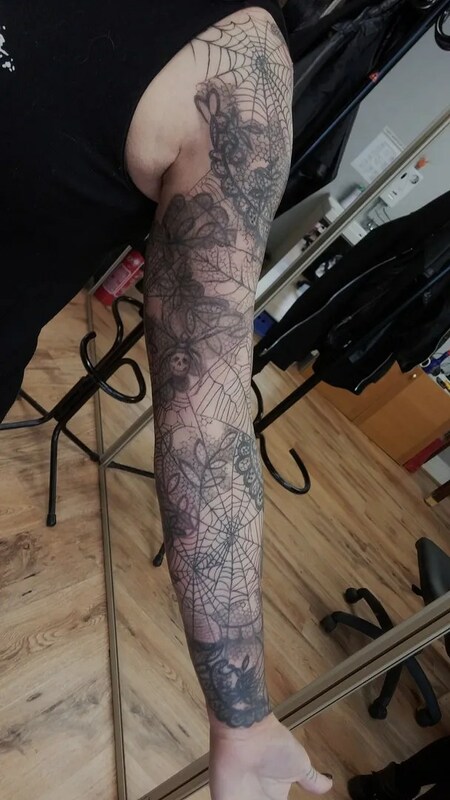 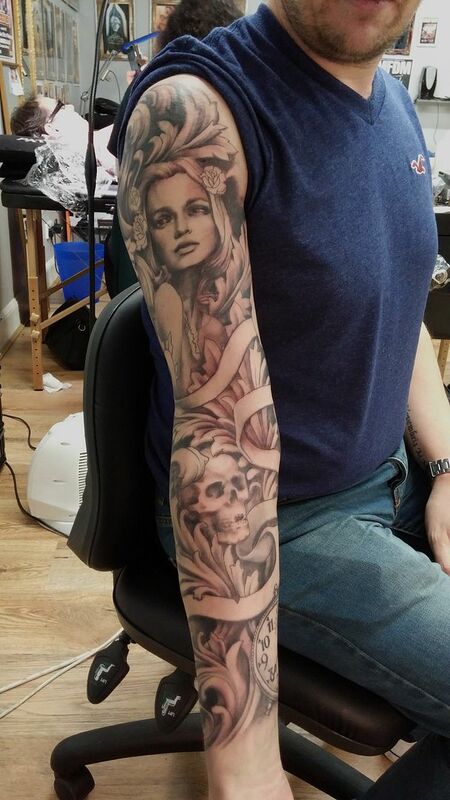 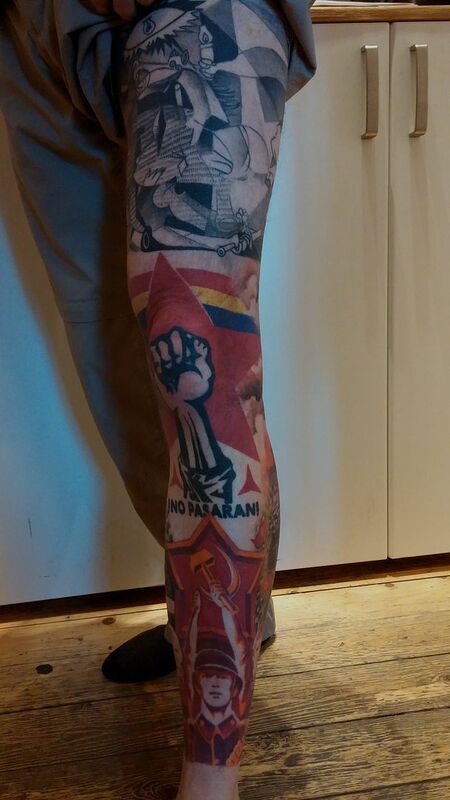 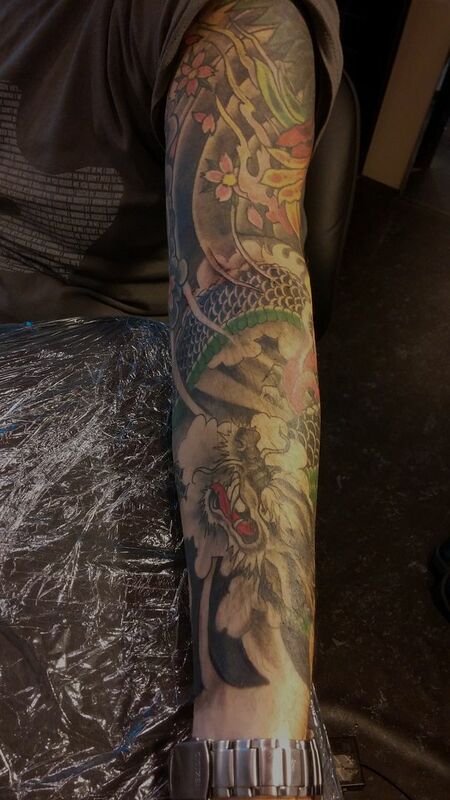 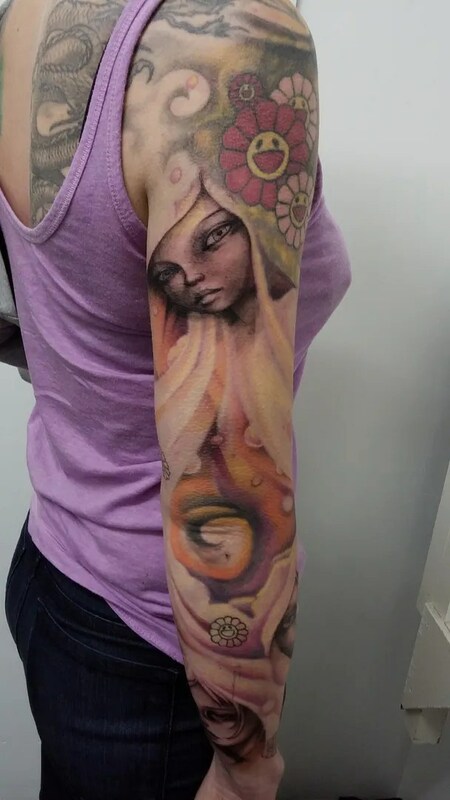 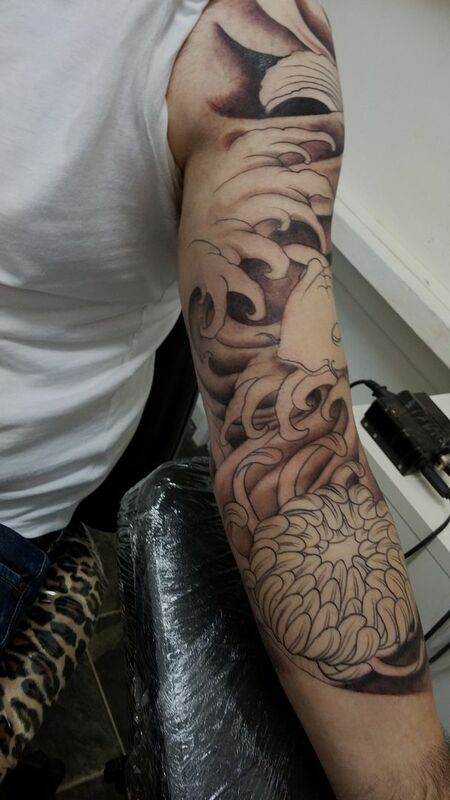 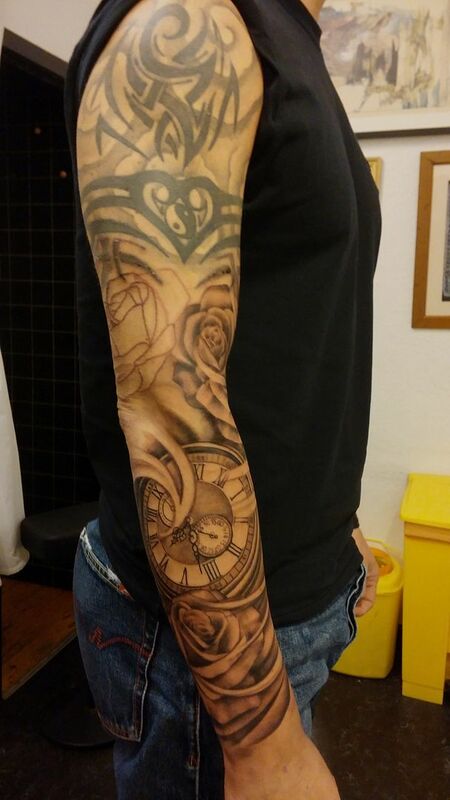 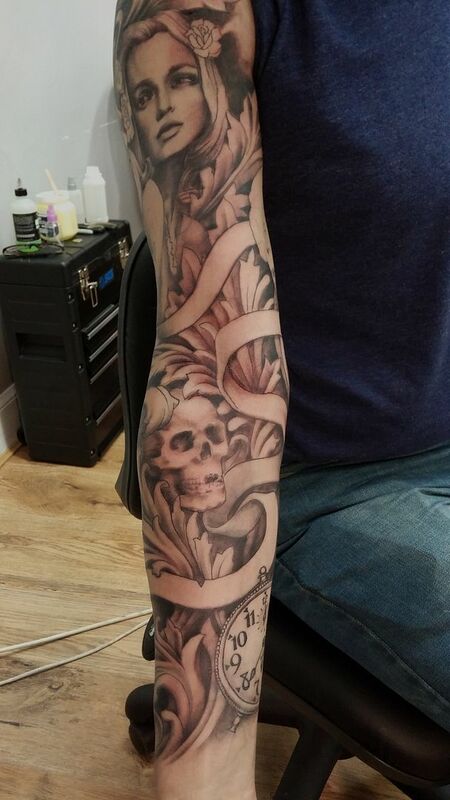 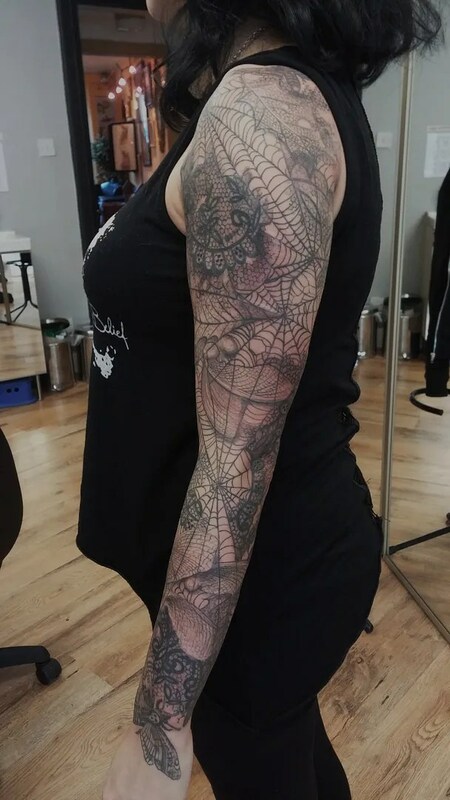 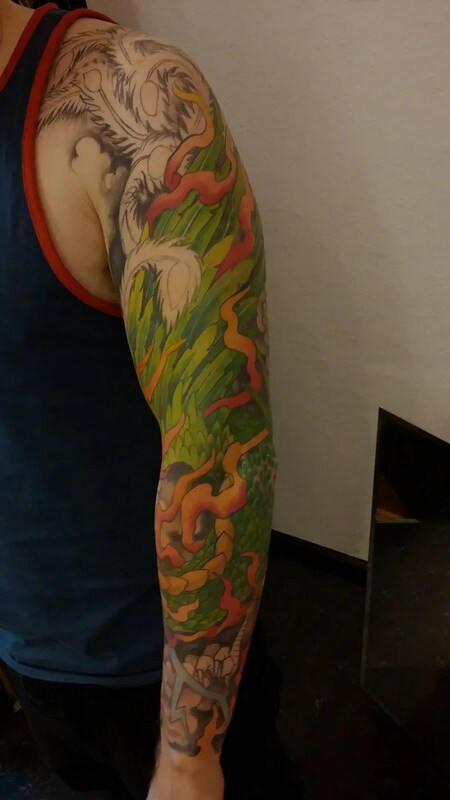 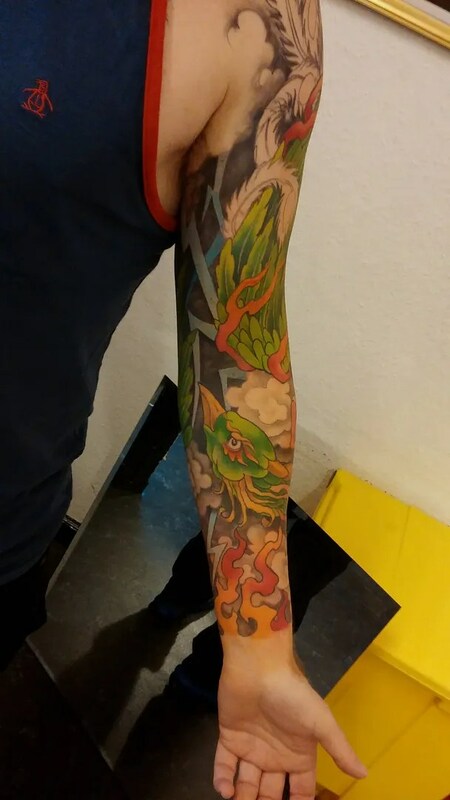 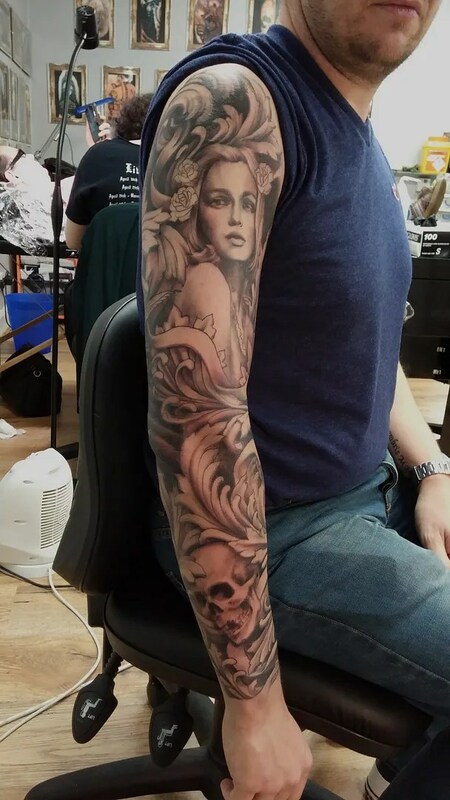 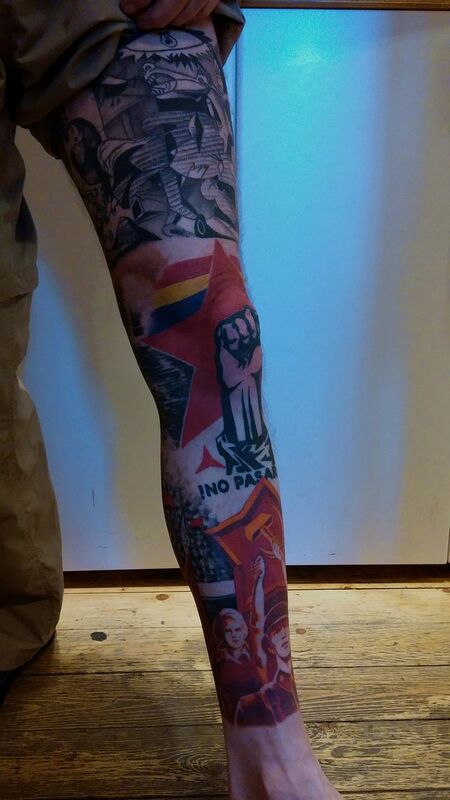 I’ve been working on a sleeve behind your backs, and this is the first time i’m posting it- now that it’s complete! 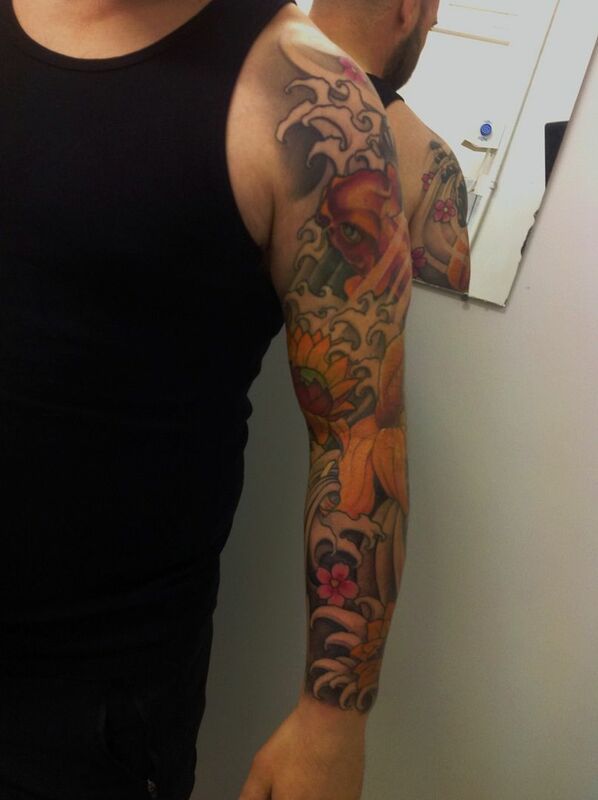 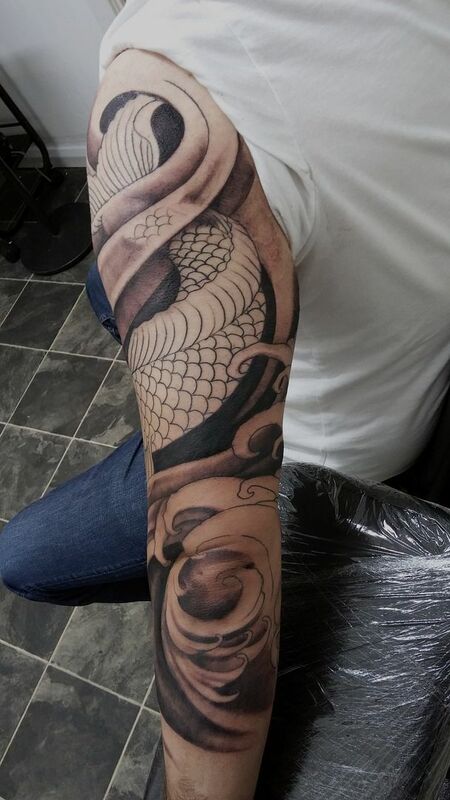 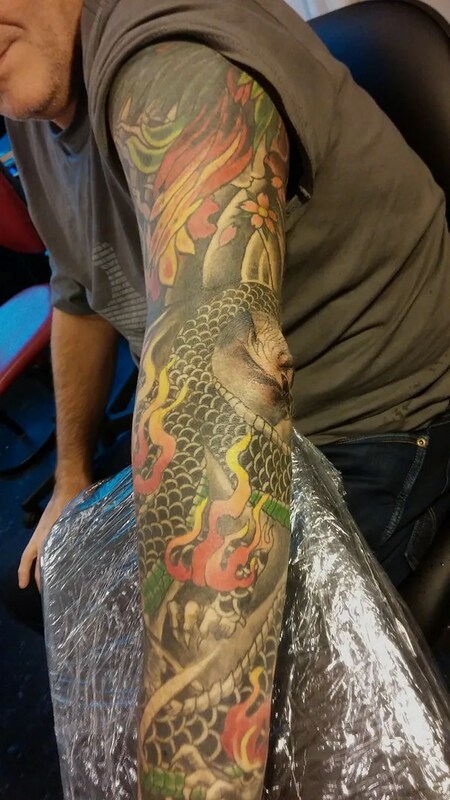 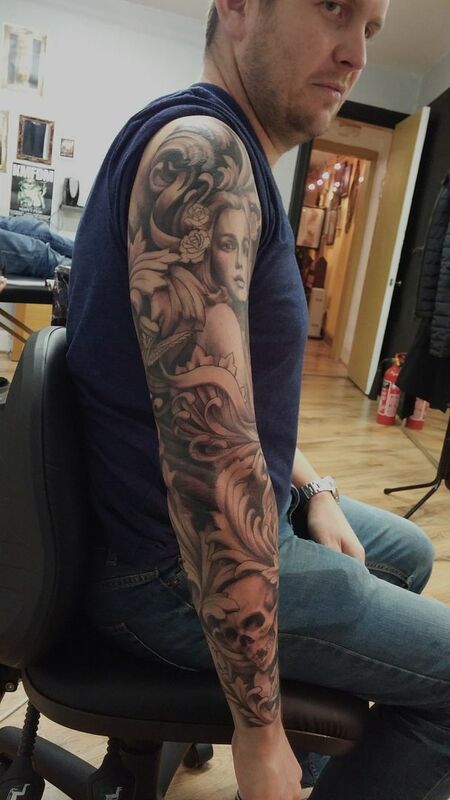 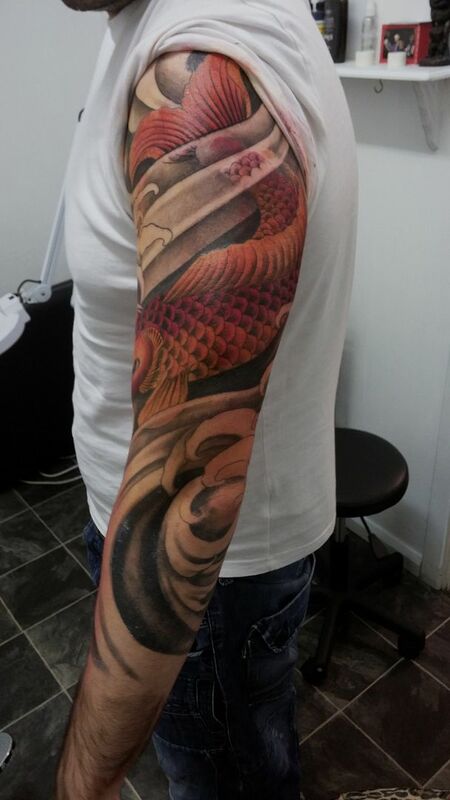 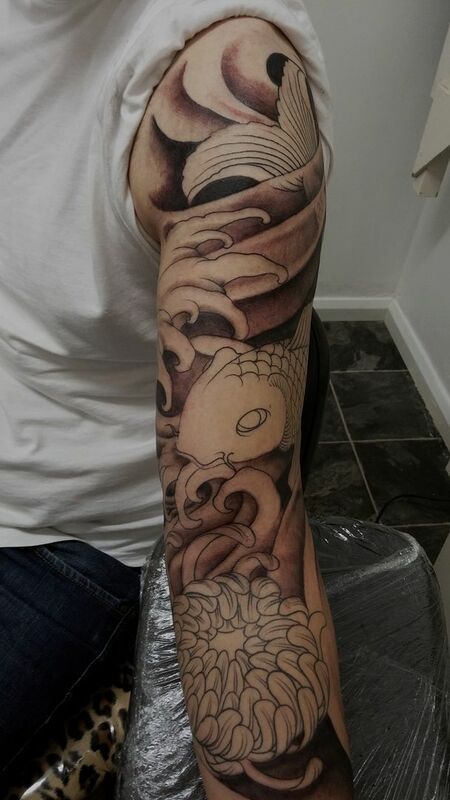 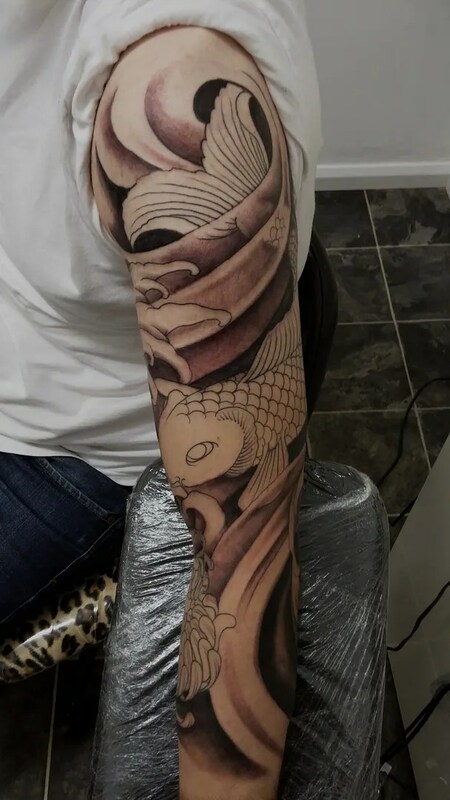 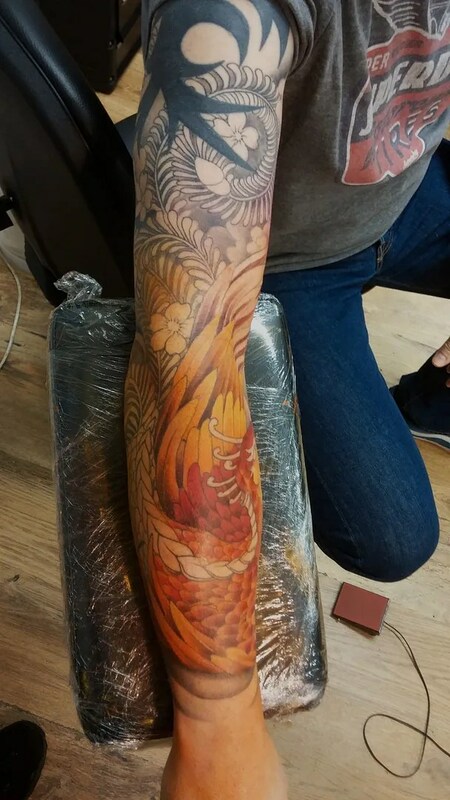 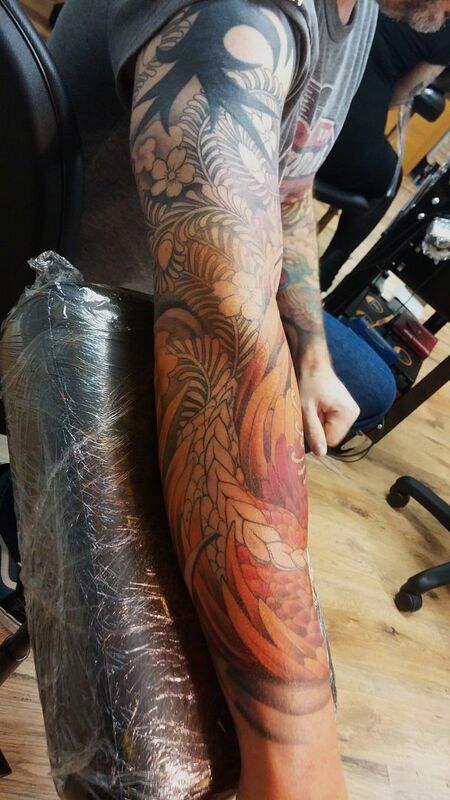 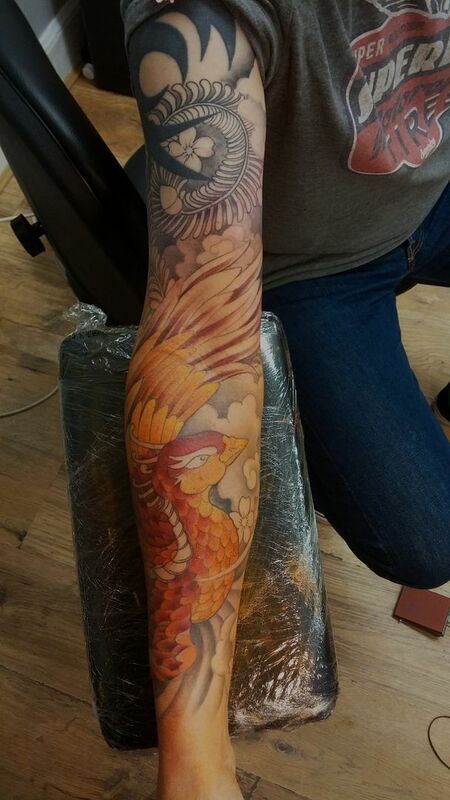 It’s been a bit of a mad project from start to finish..
Stephen just had a last wee session on his forearm dragon, a piece I added onto someone else’s work. 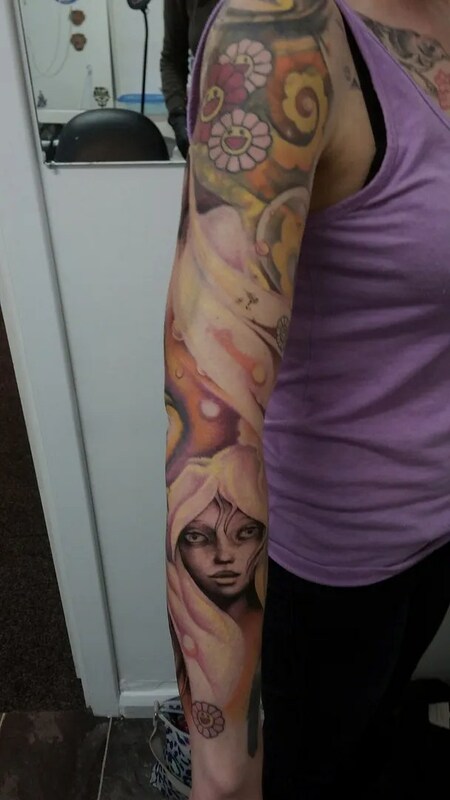 I was trying to match the existing piece on the upper arm, with the density, darkness and colours that are dictated by it. 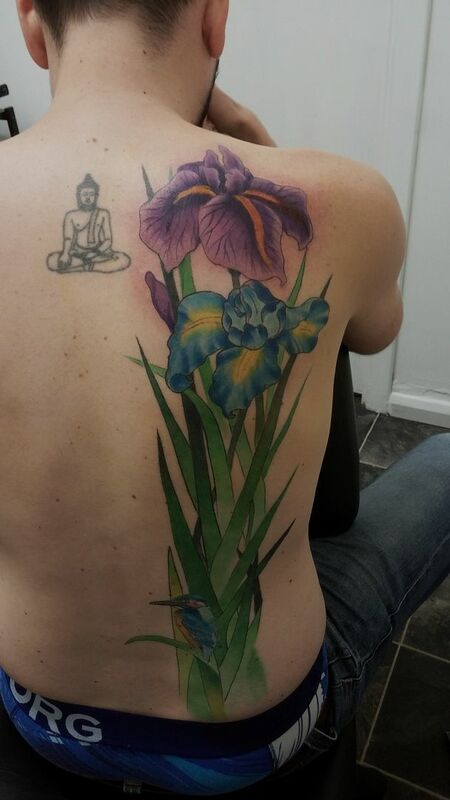 Robbie’s iris is now finished, with the wee kingfisher hiding in the leaves. 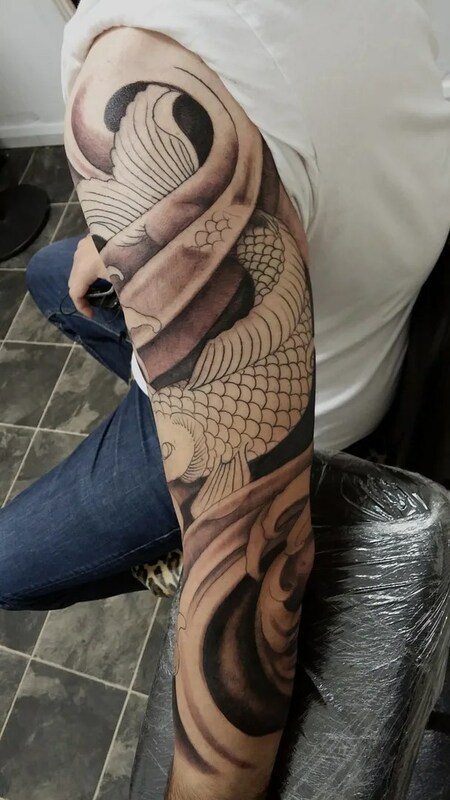 It’s maybe not hiding as well as we think, Robbie told me that on a recent holiday in Florida, someone shouted across the pool ‘nice kingfisher, dude!’…. 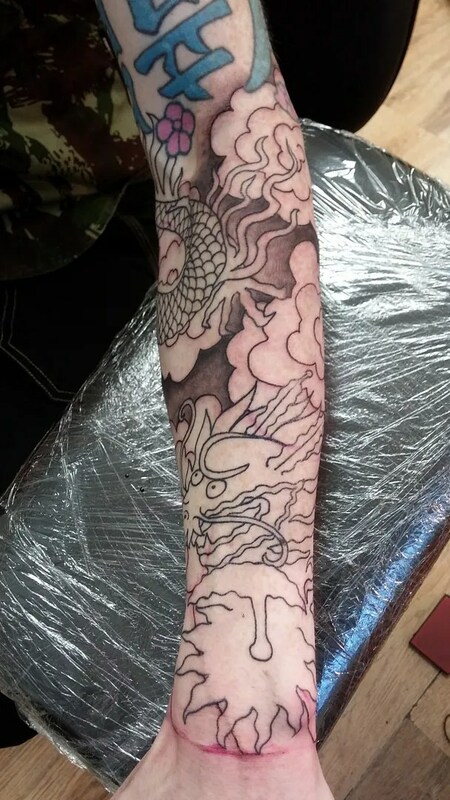 and now for a restoration job. 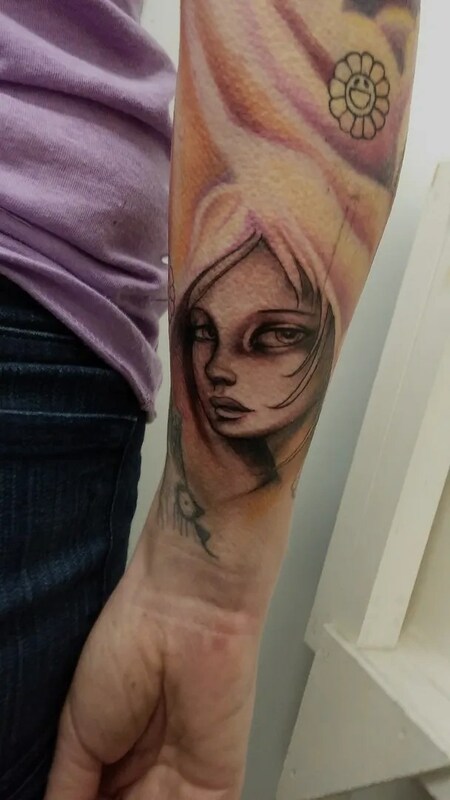 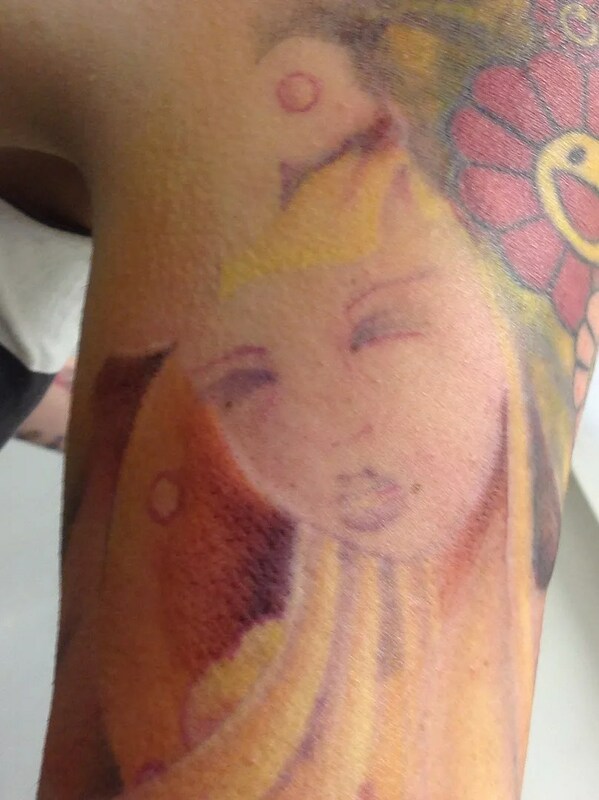 I’ve been working on Kiaran’s sleeve, it’s by another artist and is over 10 years old and has faded quite a bit. 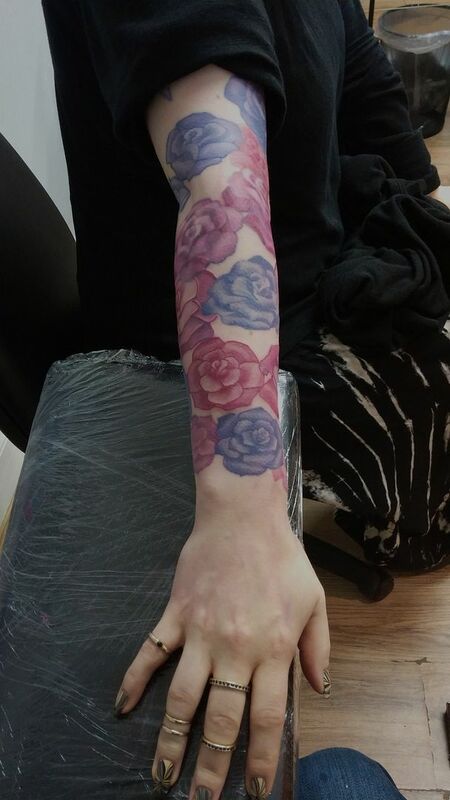 It’s a mixture of flowers and girl’s faces, but as originally no black was used, it had lost it’s impact and looked very pale. 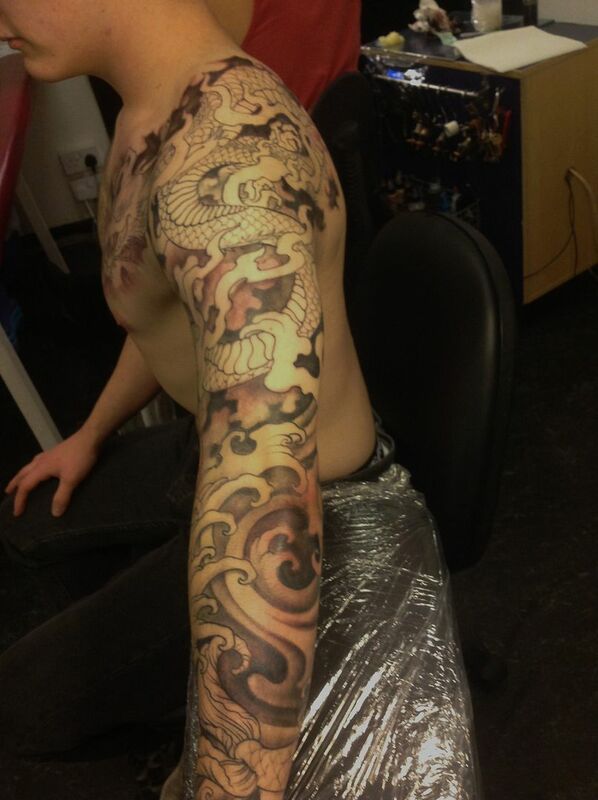 John did really well. We structured it so that the last part of the session was on a less sensitive part of the arm, but that isn’t always possible. 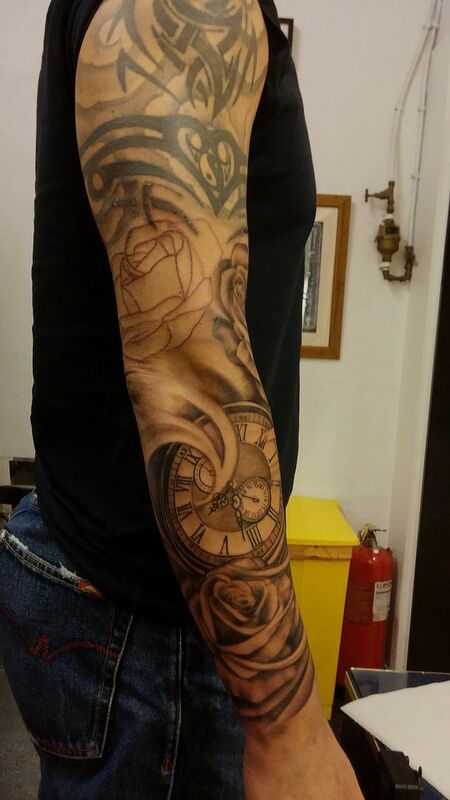 In our case we did the pocket watch last. 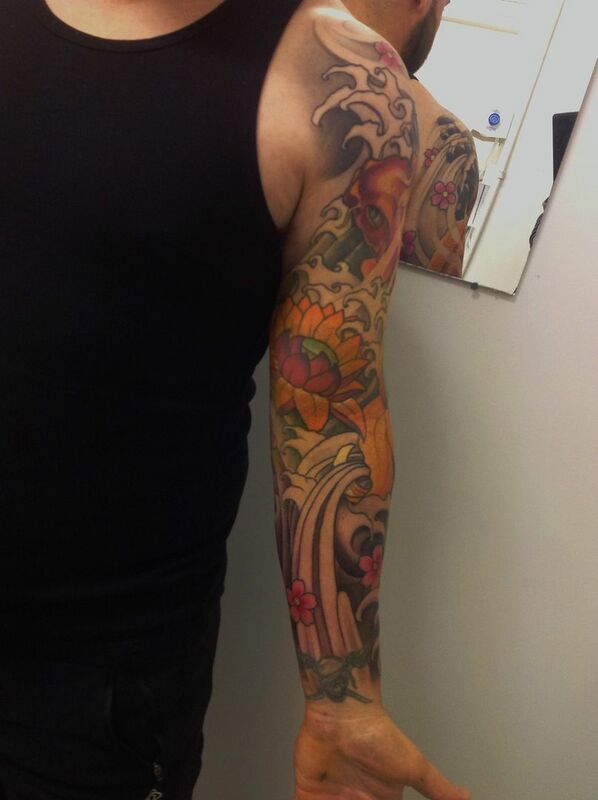 John wanted to add to a panel at the top of his arm, he had had some sections lasered, but they were still quite dark and will need more sessions. 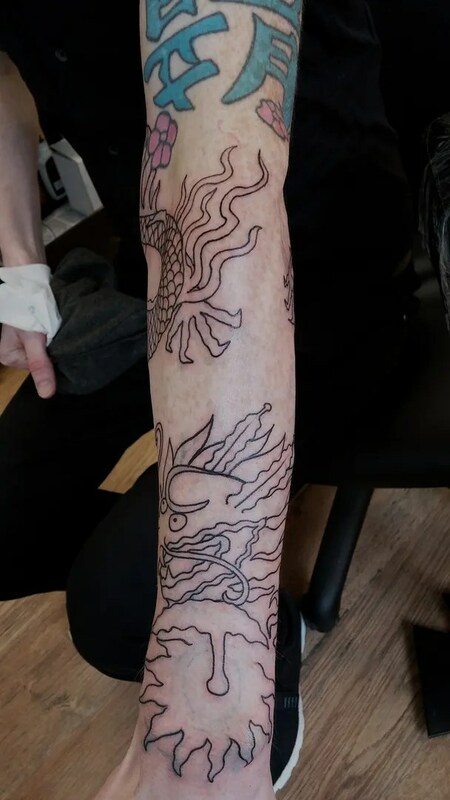 To be fair, the design is kept quite flexible at that part, so depending on how much more lasering he get’s done, I can work with it. 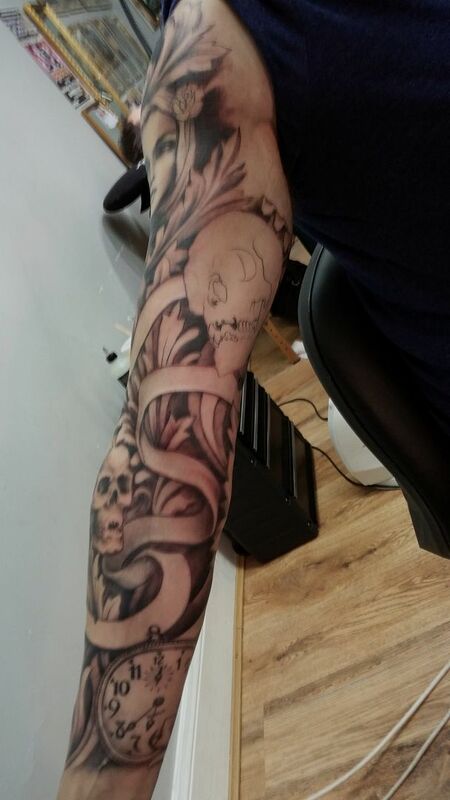 The tribal dictates the flow of the piece to a degree, just so that it doesn’t jar and look out of place too much. we did a lady with an urn, the pocket watch and some roses, all pulled together with wispy negative space like wind or rays. 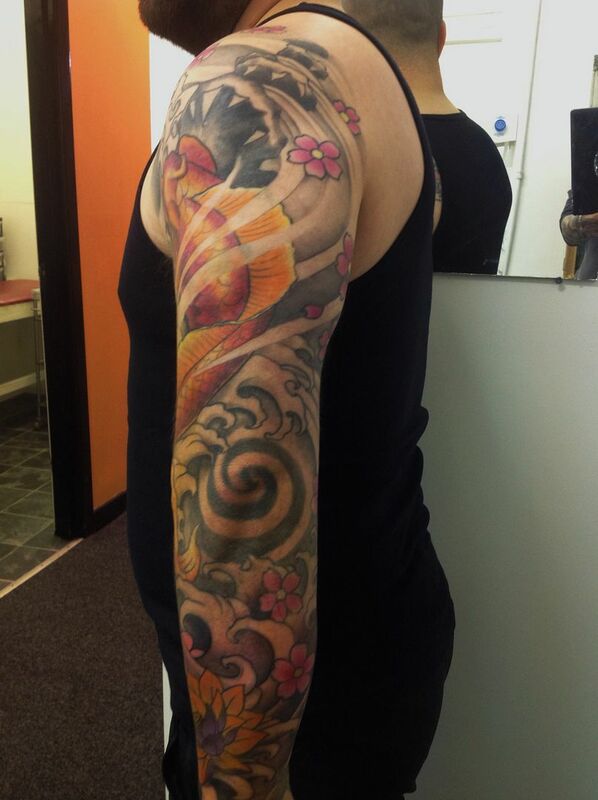 My customers are wonderful people, some have mad and creative ideas…none more so than Stephen. 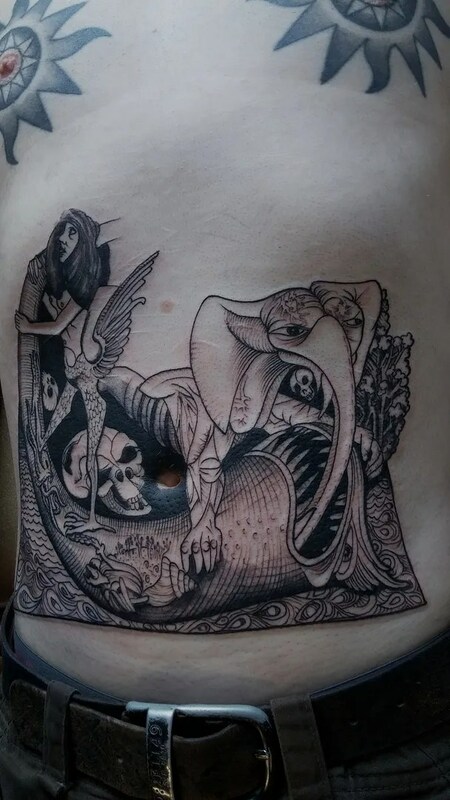 You may remember his sleeve which was a tattoo adaptation of a water colour painting by the horror writer Clive Barker, now he was after a full frontal torso piece based on a drawing by Alasdair Gray. 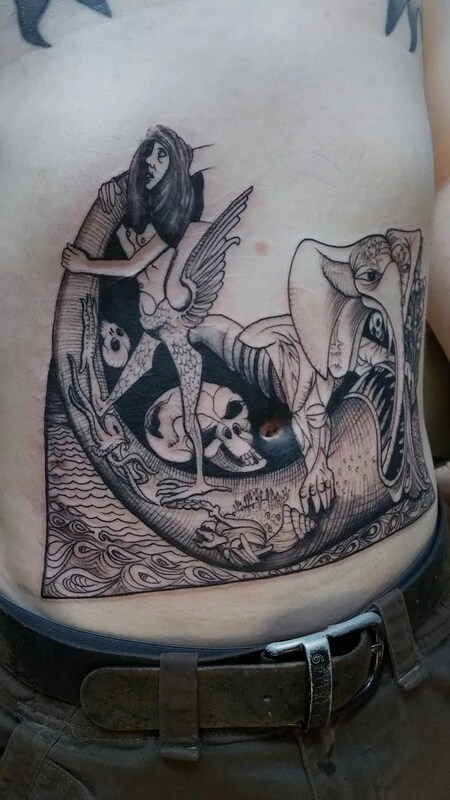 Alasdair Gray is a scottish author and artist, you may know his book ‘Lanark’, he is as madly creative as they come, so this piece is great fun. 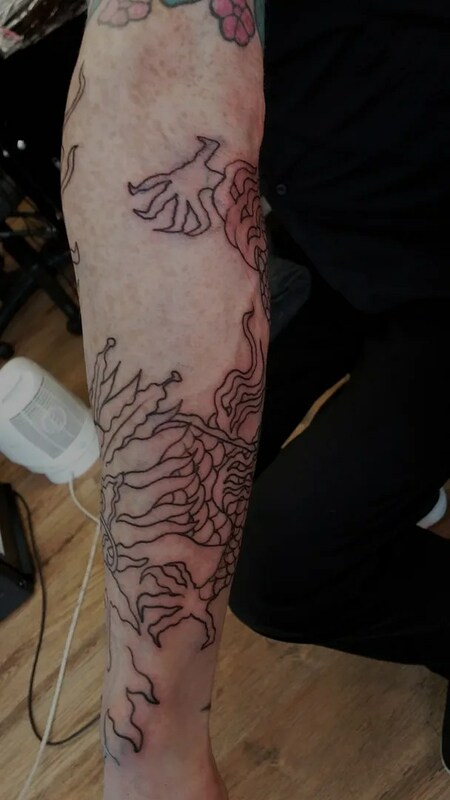 It will develop slowly, as Stephen only plans to come once or twice a year, so you will have to have patience to watch this madness unfold. 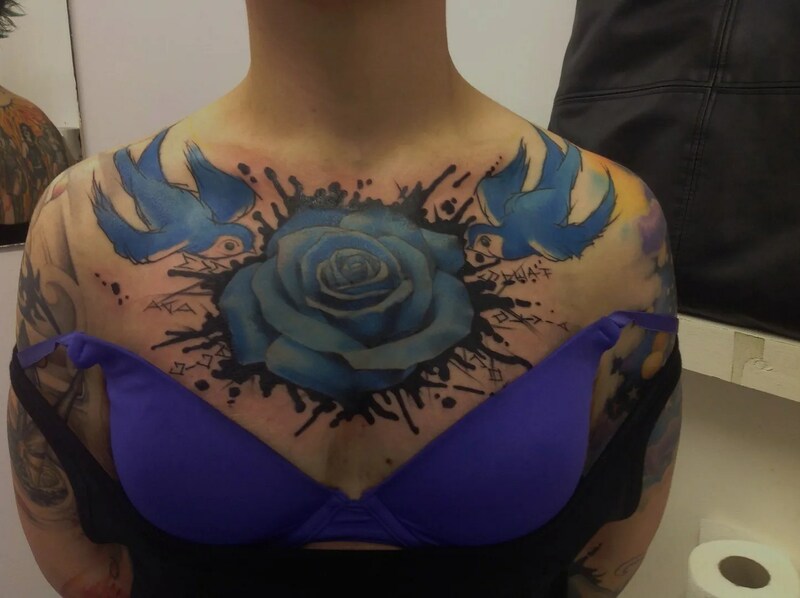 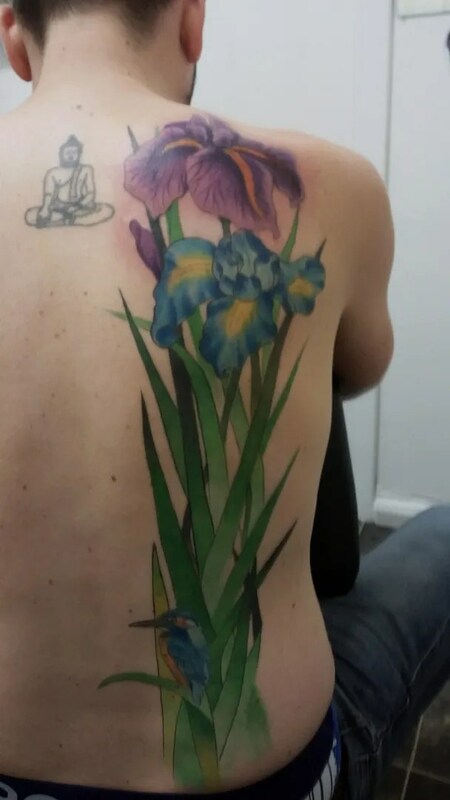 Here is the first installment, I really enjoyed tattooing all the little details from his artwork and trying to figure out what it all means..
Sadie was in next, she is getting some pink and purple cabbage roses, actually they are covering some coloured stars she got a long time ago. 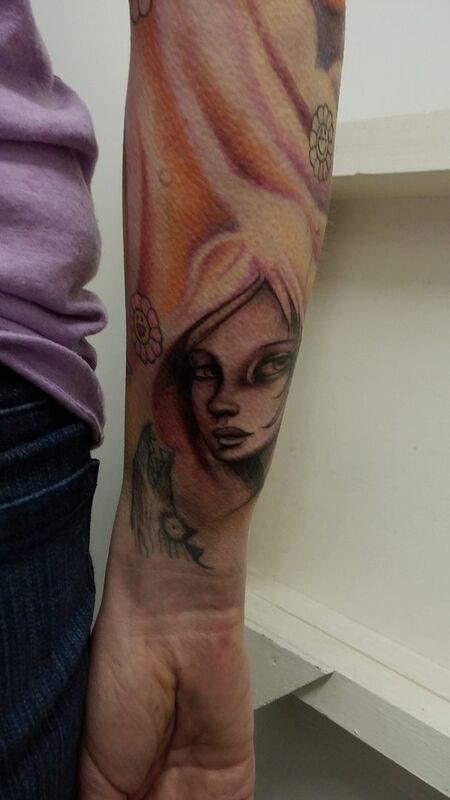 Sadie doesn’t like any black in her tattoos, and she can get away with it as her skin is so pale. 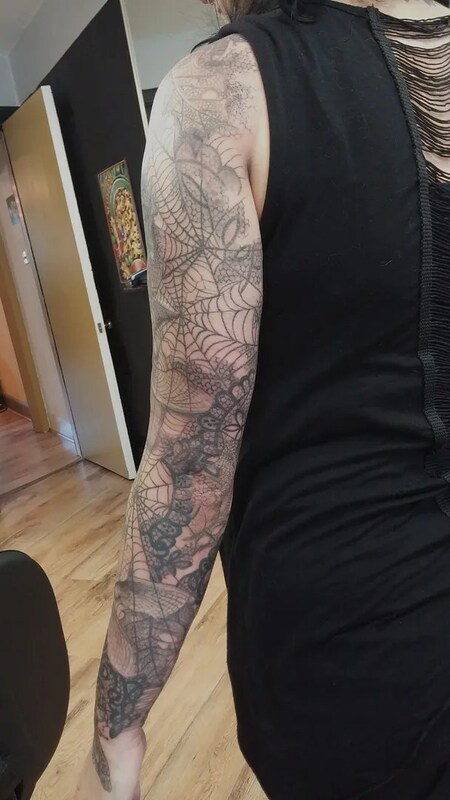 Btw, check out those fabulous nails! 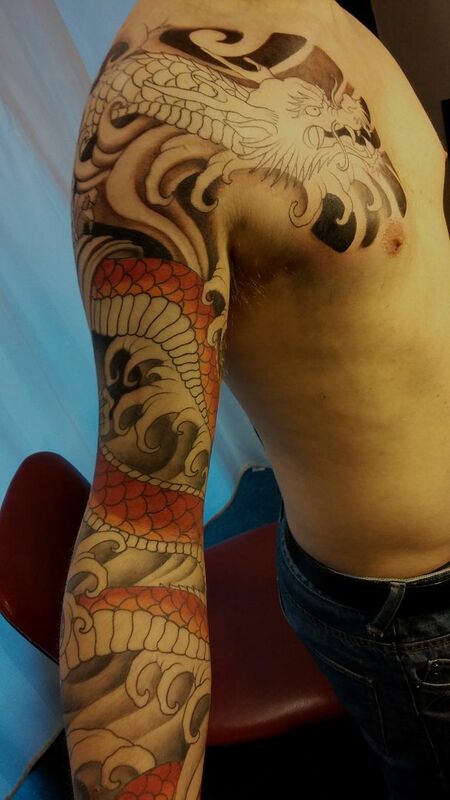 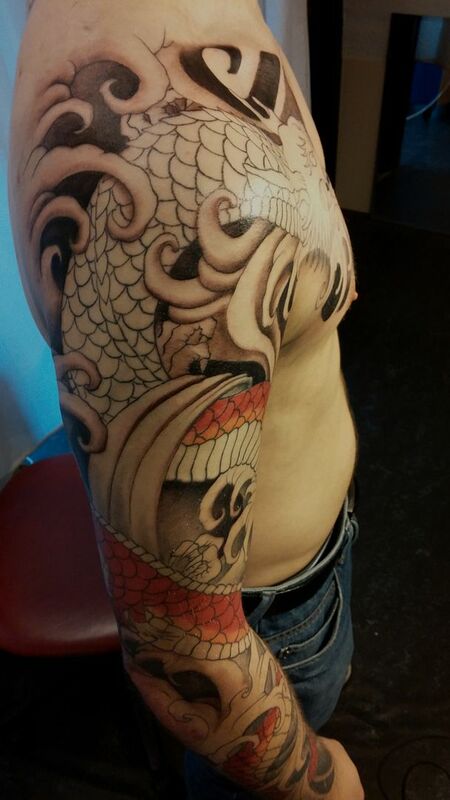 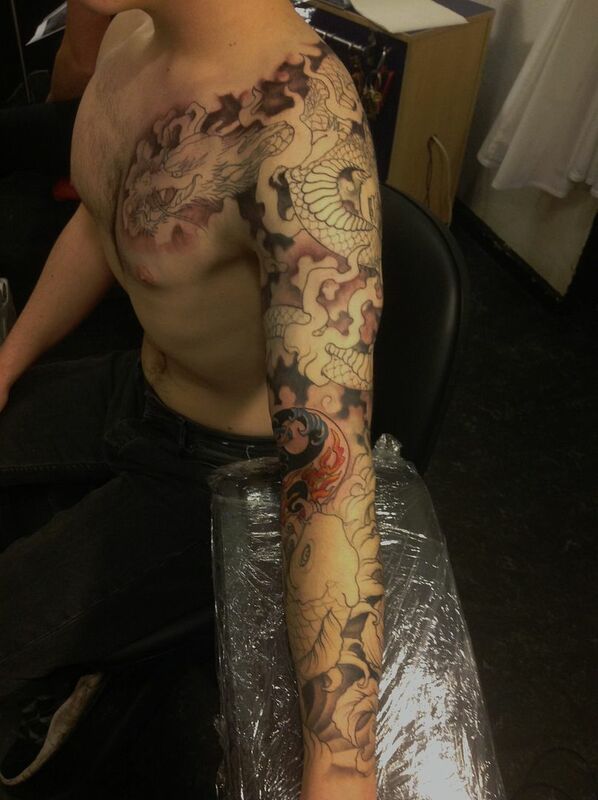 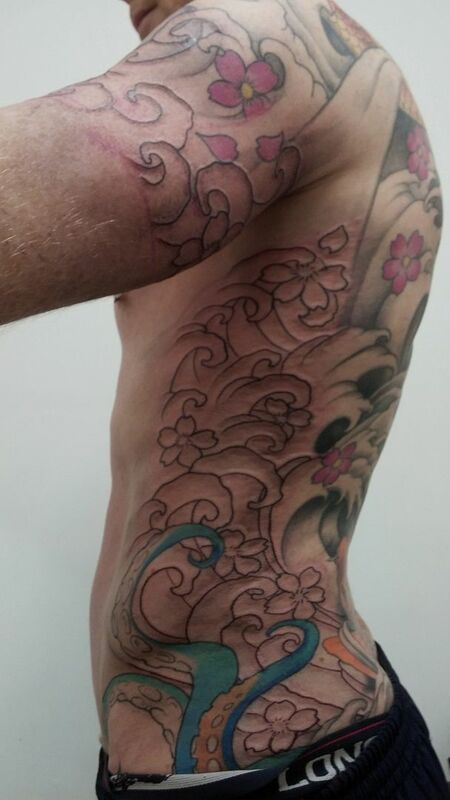 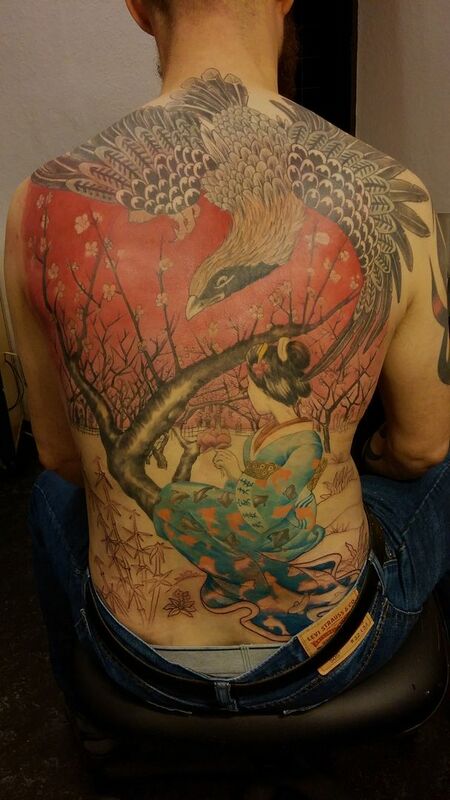 for some reason we had been concentrating on the lower part of Joe’s sleeve, but today we tackled the chest section. 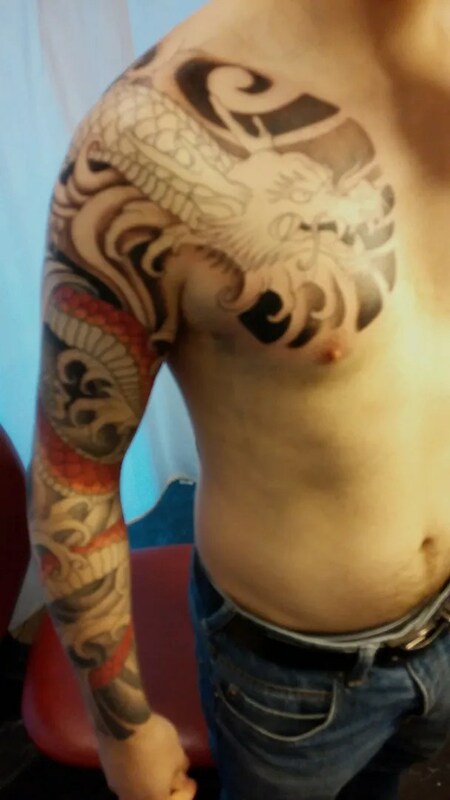 We did some background shading behind the dragon’s head and under the upper arm where we hadn’t got round to it last time. 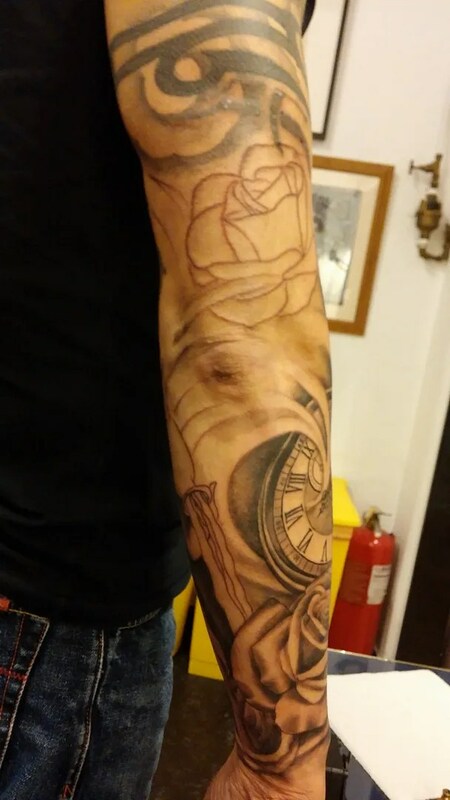 All in all a sore session.. 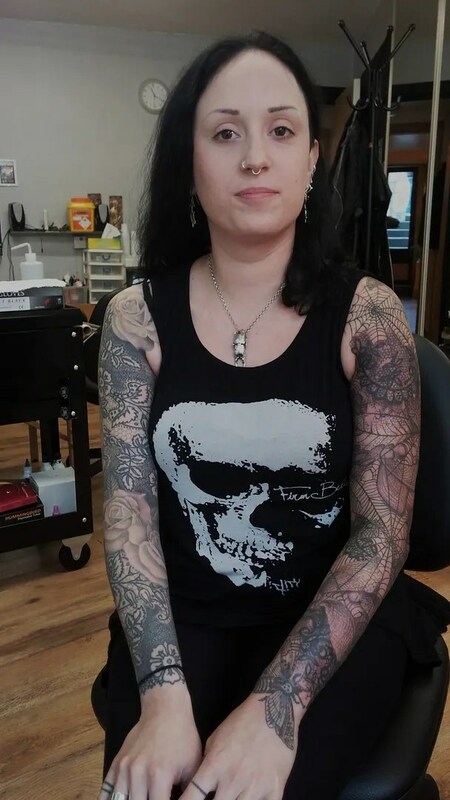 I had the chance to tattoo a day of the dead lady, or should i say, add the skull make up to an existing lady, but I ran out of time! 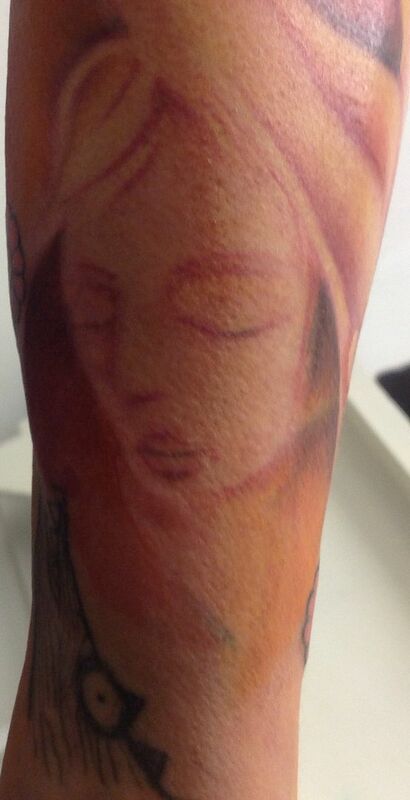 So Matthew’s day of the dead lady face is still just a lovely lady, i will add her make up next time! 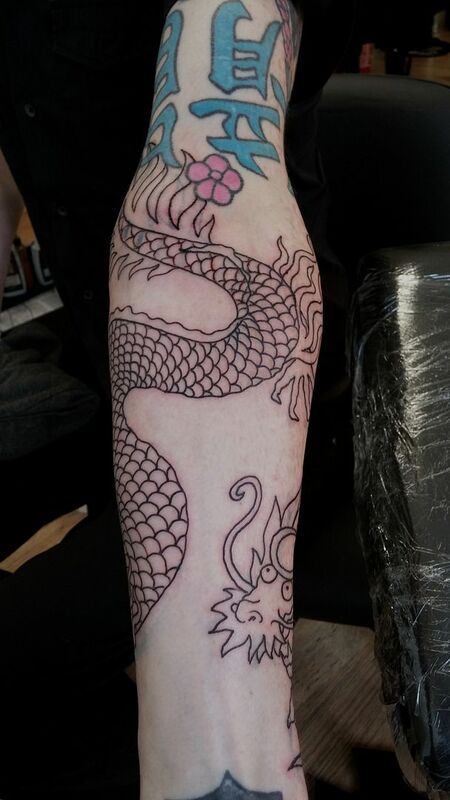 I also made a quick start on an unusual (for me) dragon, a more traditional chinese one. 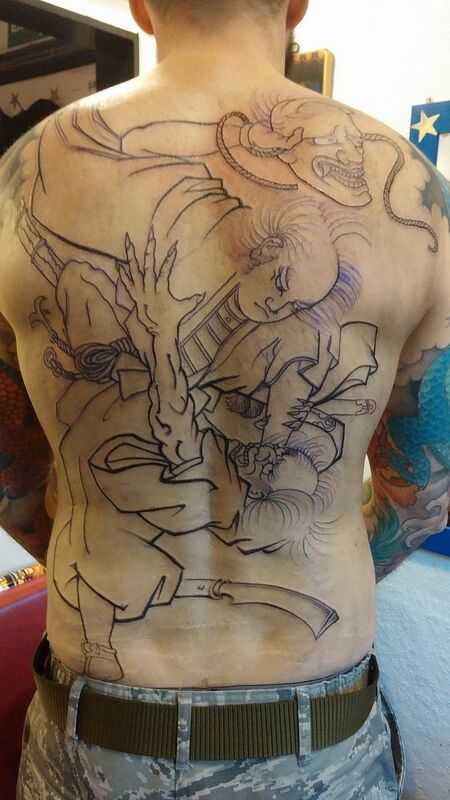 Only a short session, so just some line work today. 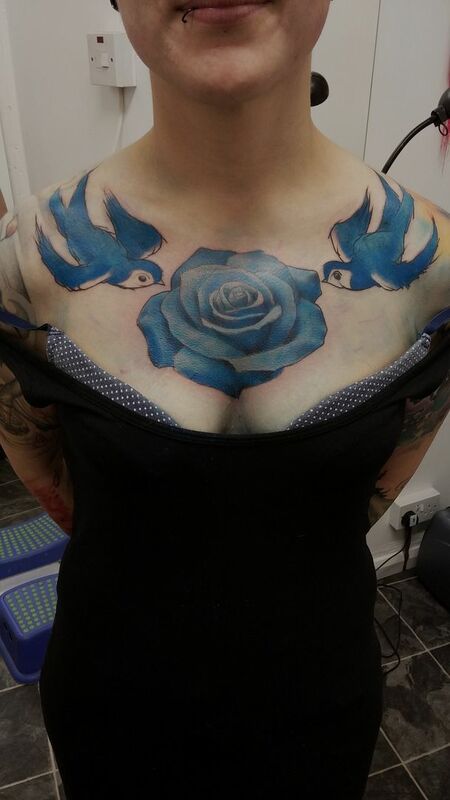 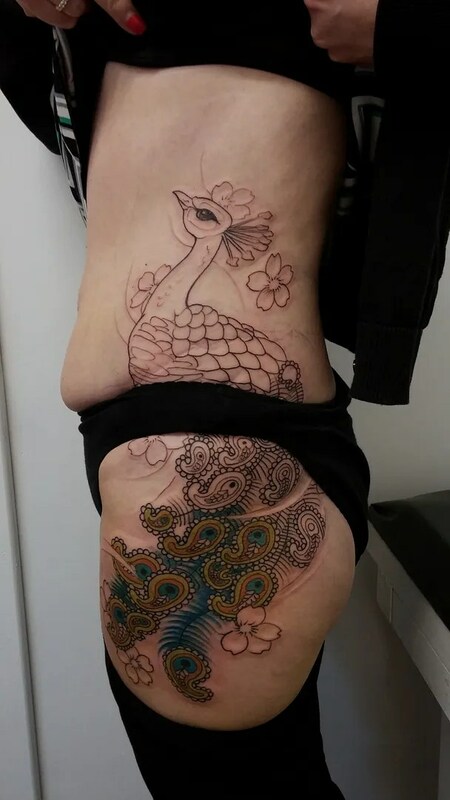 Lesley ann was in for her first tattoo, a nice big peacock on her hip, but she liked the tail feathers to be like a sort of paisley pattern. 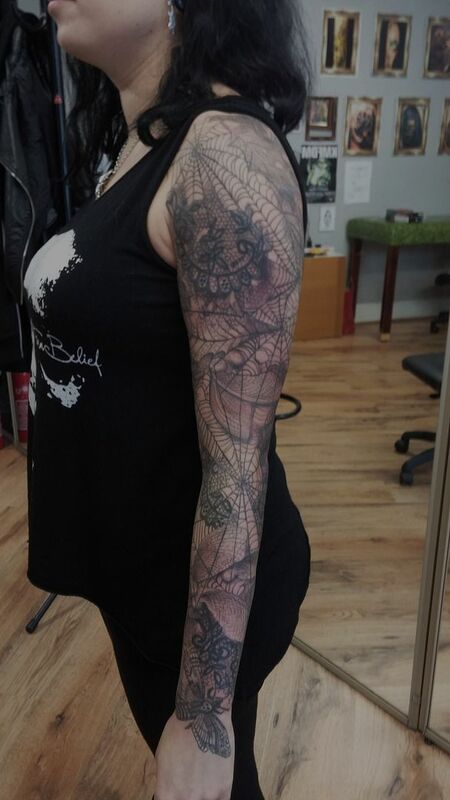 I’m a bit of a fan of paisley pattern, I have some tattooed on one of my hands. 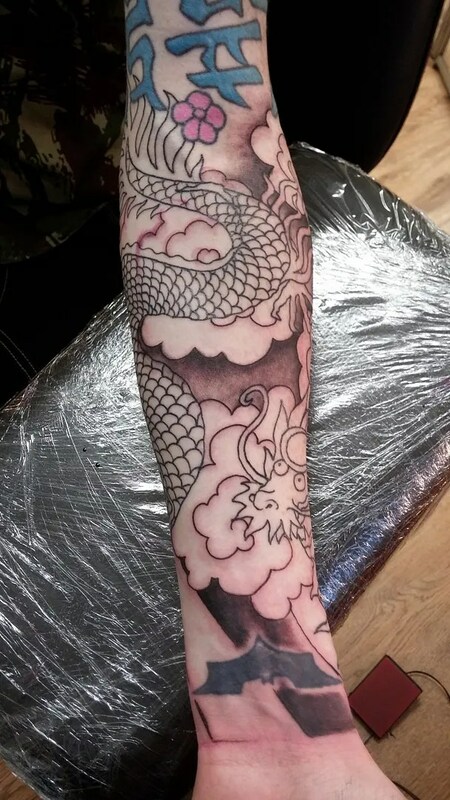 Did you know that it’s named after the scottish town of Paisley? 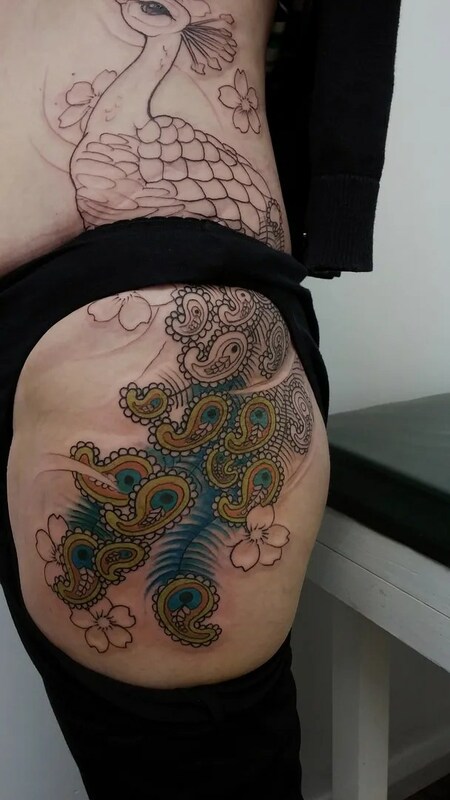 Paisley used to be a centre for cotton weaving and printing, back in the 18th and 19th centuries , and the patterns they became famous for, was their version of indian fabric patterns. A kind of indian/scottish hybrid. 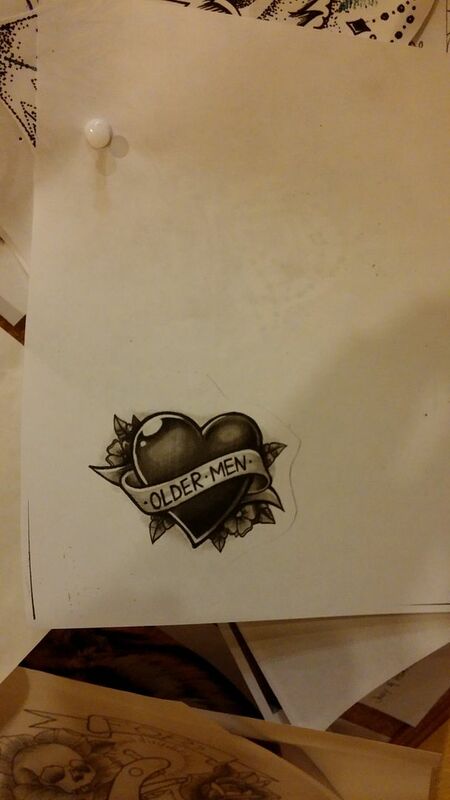 I think it’s very cool, and a kind of scottish reference without being twee.